California's bill signing deadline passed last night. The outcomes of a few specific bills send conflicting signals to manufacturers and private sector job creators about the state's interest in their ability to compete and grow jobs. AB 569 provides special treatment for some specific unionized industries by fixing 'meal and rest' regulations for only them and leaving a large majority of our private workforce and employers exposed to job killing lawsuits. This is a fix for a select and privileged few, without any justification, at the expense of every other non-union and union company in this state. Gov. Arnold Schwarzenegger's signature likely ended any chance for a comprehensive fix. This sends one of the worst signals possible to any manufacturer looking to locate or grow in California. SB 657 requires that all manufacturers report what they are doing to eradicate slavery and human trafficking from their global supply chains and allows the Attorney General to impose an injunction if he/she feels any disclosure is insufficient. California's manufacturers are already part of many worldwide initiatives to improve working conditions and prevent abuses. International human trafficking is not a state issue. The governor's signature on SB657 increases the cost of manufacturing in California and exposes manufactures to new costly litigation. This is a feel-good bill that will have no impact on third-world human trafficking but will have a huge impact on the investment decisions of our high wage job creators. SB 1272 requires personal income or corporation tax credits to contain automatic sunset or expiration provisions and detailed performance indicators to measure whether the tax incentives are meeting certain goals. This is another bill that makes competitive tax policy very uncertain for manufacturers trying to make long and short-term investment decisions. Why are performance metrics and "sunsets" ok for tax incentives but not for the the state's spending policies? The Governor got it right on this one. AB 1405 directs an arbitrary 10 percent of revenues collected by the California Air Resources Board from a cap-and-trade carbon program for undetermined purposes in a community benefit trust fund. They haven't even implemented cap-and-trade and the Legislature is already working on a "money grab". This is premature and will interfere with development of a potential cap-and-trade program. CARB must balance cost effectiveness, co-pollutant impacts, and technological feasibility as they develop regulations under AB 32. These criteria are vital to reduce greenhouse gas emissions and support the economy. The Governor got this one right too and finally showed that the cost effectiveness of any AB 32 cap-and-trade program must be cost-effective. Our next Governor must continue this oversight if California is forced to absorb a cap-and-trade program in the future. There are others (including an important career technical education bill, AB 2446, that should have been signed but got vetoed) but these are the bills that manufacturing employers have been calling on most over the past week, saying "Has he vetoed it yet?" 634,000 lost mnfg jobs and counting. California plunged again last month in high wage manufacturing employment by 2,300 jobs. The national media continues to single out California, using it as a narrative blueprint for how to overwhelm a once-thriving state economy, and almost dares anyone to bet on California's recovery. For these and many other reasons this legislative session could be the most important year of decisions in the state's 160-year history. Policymakers are no doubt giving lip service to ground zero -- growing jobs and the economy -- but there is little precedent in California for climbing out of such a monumental hole. "While Gov. Arnold Schwarzenegger worries about rising seas, his state sinks below the waves. Don't mess with Texas, they say. But California and the nation could follow its lead. "Today, California is a by-the-numbers state tragedy. Unemployment is higher than 12.2 percent as of September. Business costs are almost 23 percent higher than other states on average. Migration out of the state is at an all time high. A map by United Van Lines shows a strong demand for moving trucks as residents leave California for other destinations, particularly Texas." "Southern California is starting to look a lot like a third-world economy, service based, inequitable, serving a wealthy, mostly aging few, with little opportunity for younger workers and a large underclass. Changing the region’s prospects will be very difficult. Nothing short of a major generational change in leadership is likely to change the current sad trajectory." Today, California’s economy is not vibrant and growing. Housing is not affordable. There is little opportunity. Inequality is increasing. The state’s schools, including the once-mighty University of California, are declining. The agricultural sector is threatened by water shortages and regulation. Its aging, cracking, highways are unable to handle today’s demands. California’s power system is archaic and expensive. The entire state infrastructure is out of date, in decline, and unable to meet the demands of a 21st century economy. Indications of California’s decline are everywhere. California’s share of United States jobs peaked at 11.4 percent in 1990. Today, it is down to 10.9 percent. In this recession, California has been losing jobs at a faster pace than most of the United States. Domestic migration has been negative in 10 of the past 15 years. People are leaving California for places like Texas, places with opportunity and affordable family housing. California’s economy is declining. Those of us who live here can all see it. Yet, Californians don’t have the will to make the necessary changes. Like a punch-drunk fighter, sitting helpless in the corner, California is unable to answer the bell for a new round. "Once California companies can afford to move, they will move in droves due to the even worse business climate in that state." "Administration officials, in preliminary discussions with state lawmakers and other Sacramento officials on how to close a projected $20.7 billion deficit, were pledging to push hard for as much as $8 billion from the federal government." "Bad decisions made in Sacramento in recent years help explain why California's prospects for a timely economic recovery are looking considerably worse than that of other states. Those decisions also help explain why California is the most expensive place in the nation to do business." "I believe that the state of California is at a major crossroads. I believe that we have members of the Legislature who have never operated a business, made a payroll or taken a risk." California is broke. The poor are worried about losing benefits. California companies don’t want to pay more taxes. Someone has to lose for the other to win, right? The media likes a good fight, and the bell has rung in Sacramento for a heavyweight bout. In this corner, greedy businesses get tax breaks and in that corner the poorest and most vulnerable citizens are denied healthcare. But the question is: Will the policy choices at the end of this cage match make us a better and more successful state? Last night I heard a father tell his screaming, red-faced child: "Take a breath, buddy, take a breath." We have become that child. Let’s take a breath. Policymakers have daunting decisions to make. We need to be guided by deep analysis to make strategic value-driven decisions. We don’t need the media to perpetuate the notion that this should or will be decided simply by who has the strongest lobby in Sacramento. Sadly, this notion was perpetuated in a San Jose Mercury non-editorial piece this week that in so many words, and with limited retort, stated that the poor will lose because of back room deals that gave business $2.5 billion dollars. Readers and voters should be afforded more than this. Let's face it, after the recent May 19 "elective yawp" on taxes and the budget, the voters have finally become very real pressure points for our policymakers to make decisions. So let's give them the entire picture. Mercury: "Corporate tax giveaways from dead-of-night budget agreements in September and February will cost the state as much as $2.5 billion in revenues at a time when lawmakers are contemplating eliminating programs for the poor, a budget analyst said Wednesday." MPowered: That budget analyst is a well respected and ubiquitous lobbyist for the poor in the State Capitol but that statement is very inflammatory and does nothing to solve any problems. A further analysis would indicate that California has one of the highest corporate tax rates in the country. Businesses were hit with $9 billion in tax increases in the last two budget deals -- one increase was a first-in-the-country corporate tax penalty policy that was completed in 24 hours in the fall budget and now has removed $2.7 billion dollars from the economy in the form of overpayments. SJ Mercury: "The problem with dark-of-the-night deals is that you never get a chance to get a debate over value choices," she said. "These tax breaks represent a reduction of one-third the income taxes paid by California corporations..."
MPowered: The same lobbyist used "dead-of-the-night" in her first quote and "dark-of-the-night" in her second. It's like a Martin Scorcese film in here. Again, the entire quote needs more analysis. "Value choices" is a spot-on term for the budget tipping point(s). Solutions will all come down to what we value most. Programs for the poor are the very obvious part of that equation. Creating more opportunity for careers and high wage jobs is equally as important. If we value the high wage employment so desperately needed in California, we need to a certain extent tax policy articles (and a debate) that juxtapose the $9 billion in increases heaped on corporations versus job creating tax policies. Again, we already have one of the highest tax rates in the country, as well as one of the highest per capita government spending budgets. SJ Mercury: "The single sales factor, the memo said, spurs job creation by eliminating the tax penalty for increasing the number of employees on payroll. A 2005 study contradicted those arguments. The Center on Budget and Policy Priorities, a nonprofit research institute in Washington, D.C., found that while most states have lost manufacturing jobs since 1995, states that went to the single sales tax formula did not fare much better." MPowered: Most states have lost manufacturing jobs since since 2000 (a common CMTA year of reference) and I'm assuming since 1995, per the article. As a percentage of gross state product (GSP) though, no competing state has lost as much as California since 2000. According to a yet-to-be-released report on California manufacturing, the industry's share of the state's GSP has declined 9.8 percent. Comparatively, Texas manufacturing gained 24 percent of its GSP and Oregon gained 66 percent. And as stated so many times before in this blog, California has lost 30 percent of its industrial base since December, 2000, more than any other state. SJ Mercury: "While the Franchise Tax Board is not authorized to release the names of taxpayers, Ross noted that a handful have aggressively pushed the single sales factor legislation in previous efforts, including Apple, Genentech, Paramount Theaters, Disney, Intel and Warner Brothers. MPowered: Are we to deduce that a large portion of Californians don't want the jobs these companies bring to California? Is the fact that we've gained 163,000 government jobs and lost 235,000 private sector jobs since 2001 a good thing? Let this blog be CMTA's virtual breath going into understandably difficult and engaging times. We'll do everything we can to temper the conflict that the media is spawning, making a difficult situation worse for our policymakers. That breath will unveil principles and facts that help our policymakers find ways to grow the economy, employ our workers and, according to the aforementioned lobbyist's website, "improve public policies affecting the economic and social well-being of low- and middle-income Californians." California's Air Resources Board continues to formulate plans for cap and trade, mandatory reporting, carbon offsets and other mandates to reach bold California-only emission goals. There are, though, other forces out there promoting change that are a win-win for everyone. 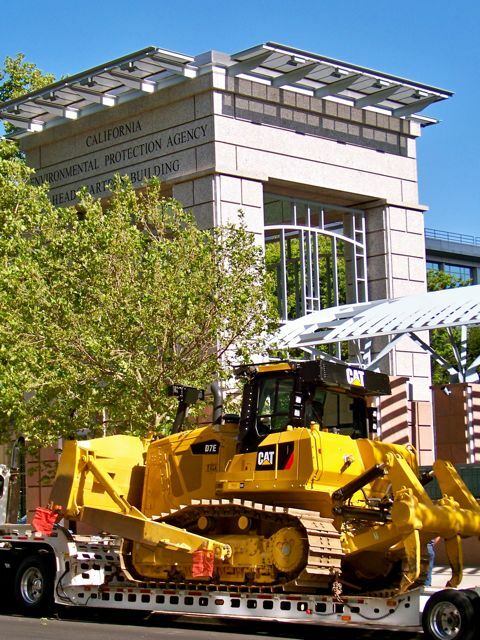 Take for example the Caterpillar D7E Track Type Tractor (what we call a bulldozer and pictured below) that was unveiled last week in front of the Cal EPA building. This innovation screamer is a result of Caterpillar's focus on the marketplace and reducing the operating costs of their customers. CARB acknowledged this innovative approach for powering these off-road machines at the recent unveiling of their new funding program for clean engine technologies (see CARB release). The machine looks like all the others you see working at various construction sites across the state. It's only when you open the hood that you find that this machine is not like all the others because it relies on a new diesel electric drive technology that like a hybrid uses an engine to generate electricity which then runs most of the applications on the machine. Unlike a hybrid it doesn't store the energy but uses it to keep the machine cutting through the dirt - at a 20-30 percent fuel economy improvement (which equates to an equal amount of CO2 reductions). So why is this Important? California leads the way on emission efficiencies, ranking second only behind Rhode Island according to the "2009 Competitiveness Redbook". This position is the result of the ingenuity of California's workforce and manufacturers, and measures like CARB's grant program that incent cutting edge companies to help California lead the way. We must ensure that the state's greenhouse gas policies and mandates don't hamper these innovations which have made California a recognized leader. Governor Schwarzenegger has laid out lofty greenhouse gas reduction goals -- 20 percent by 2020 and 80 percent by 2050 -- so maybe a 20 to 30 percent fuel economy improvement for a bulldozer doesn't seem like much, but when you add up the fact that this machine can burn through more than 2,500 gallons of fuel a year, those savings start to add up. 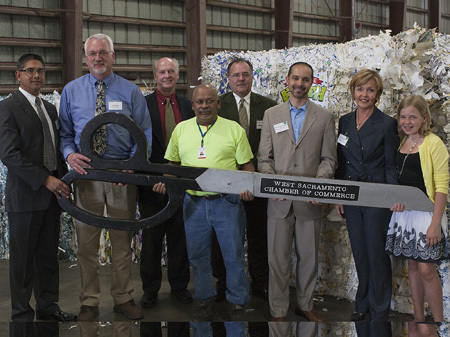 Last month, International Paper rolled out its newest recycling facility in West Sacramento -- 57,000 feet of acreage and 30 employees will take their place in IP's Recycling Business which manages over 6 million tons of recycled paper per year. IP said they intend to grow more in West Sacramento, but of course operating costs will dictate if and when that plays out. This facility alone (one of three in California) will process 4,000 tons of material per month. West Sacramento Mayor Christopher Cabaldon and California Integrated Waste Management Board Chairwoman Margo Reid Brown both appeared at the ceremony to congratulate IP on its leadership. Why is this important you ask? This is the second company in California that unveiled in the last two weeks yet more green contributions that were not a result of government mandates, but outcomes of public awareness campaigns, market shrewdness, innovation and customer demand. A 2008 PPIC report that found limited amount of job migration out of California. The notion that California's business climate is unchanged from many years ago when the state experienced an economic boom. I assume he meant the 90's. The PPIC report did not account for decisions being made NOT to come to California (only decisions from companies already existing here). A key component to backfilling the 528,000 lost manufacturing jobs since 2001 is the myriad of siting decisions being made across the country, where we don't even know if and when we dropped off a company's list in the first place. Anecdotal information says too many companies decide to forgo the risks of costs and uncertainty in California and the trend does not look good. 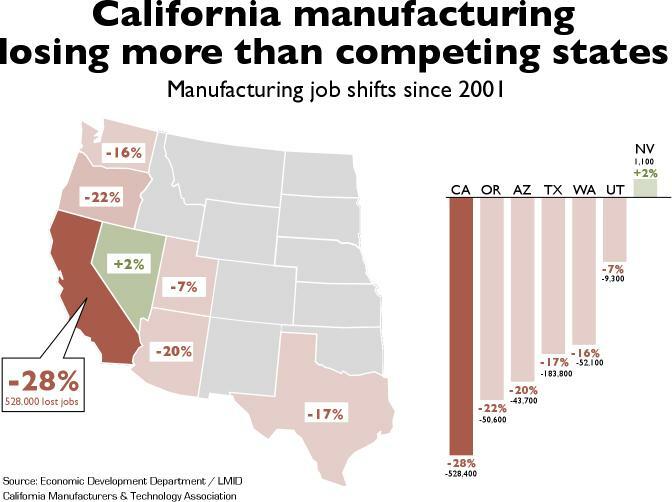 The expiration of the Manufacturers Investment Credit in 2003 made California one of only three states (with Wyoming and South Dakota) that tax capital manufacturing equipment purchases, yielding an even higher tax burden than the rest of the country. The passage of AB 32 and the ongoing regulatory efforts have created prodigious amounts of uncertainty for any manufacturer looking to grow or site in California. Policymakers and the media need to divert themselves away from disproving job migration and start zeroing in on what helps the private sector -- especially the high wage portion -- flourish in California. That's what Nevada is doing ... and Assemblyman Dan Logue -- who Walters admonished for creating a "media stunt" -- is taking a few hours to understand their policies and their success. That can't be a bad thing.